AUNTIE MOMO DESIGNS is committed to bringing cost effective and unique designs to businesses with big ideas but not necessarily bigger budgets. We've designed sites from Grammy-nominated artists to Indie bands and from multi-million dollar corporations to small start-up businesses. Whether you're an international travel agency or a small business owner, we can design a site for you! 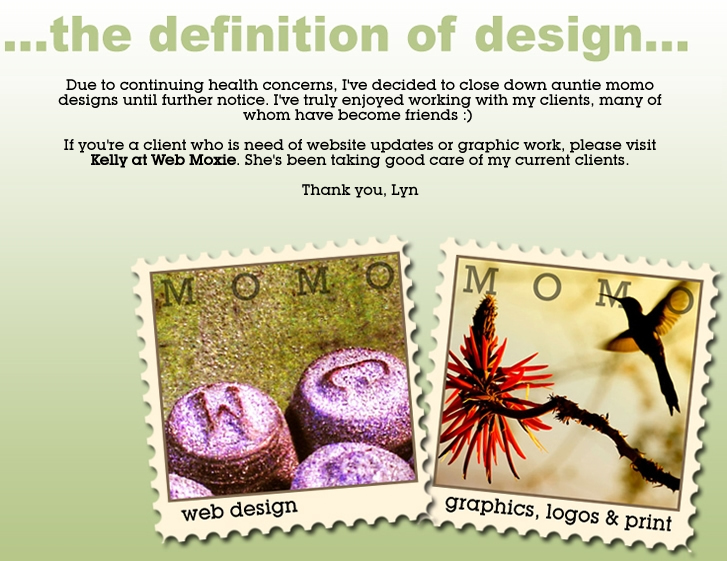 AUNTIE MOMO DESIGNS can help you freshen up a stale and stagnant website! It's amazing what a splash of color will do or a new logo or even a new layout. We've done extensive redesigns of existing websites attracting new visitors while retaining current ones. We also do regular site maintenance on a cost-effective hourly basis. You only pay for work done! AUNTIE MOMO DESIGNS can create a new logo for your site and/or business as well as provide brochure, business card and other print-work design. We seamlessly integrate a cohesive website design and logo branding to ensure your message is consistent and memorable.